Figure 6-15. - Shop load plan (specific job orders). 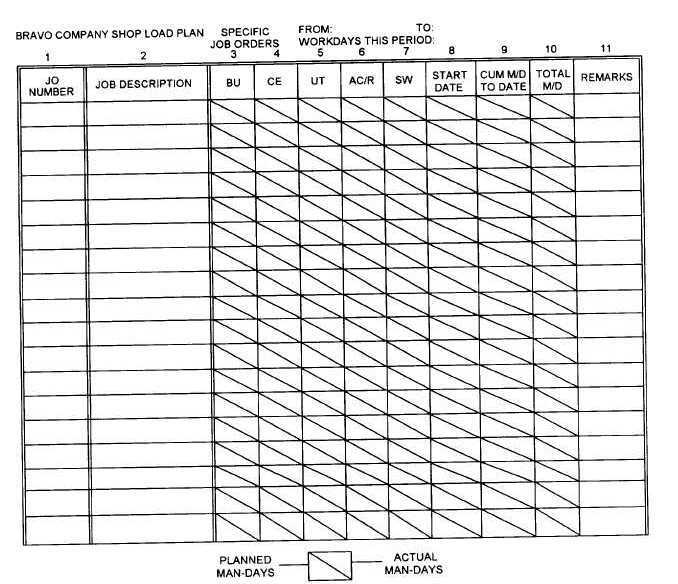 Block 10 indicates the total estimated man-days for the specific job orders. Block 11 is used to note work assigned to other companies if priority and availability of shop personnel will not permit completion within an acceptable timeframe. List all SJOs with a brief narrative description in blocks 1 and 2. Blocks 3 through 8 show planned use of manpower. Block 9 displays the cumulative man-days expended to date. For management to evaluate the effectiveness of job estimating, manpower utilitzation, and performance, the shop load plan must be marked at the end of each 2-week period. The marked plans contain the actual start date, the end date, and the productive labor expended on each job order. In addition, the manpower availability summary and work plan summary are marked to reflect actual man-days expended.